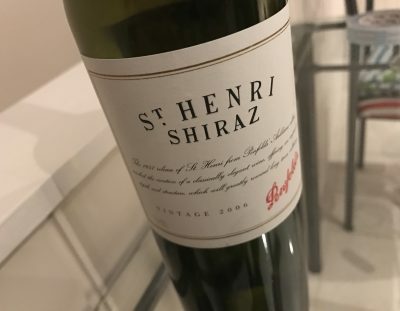 Let’s check in to see how this Penfolds St Henri looks now. Surprisingly sullen. There’s still that easy plum fruit, with a dusty edge and fruit that expands through the palate. Despite that width, this ultimately feels oddly mid-weight – as if this is St Henri lite. You’d even call it elegant, if subdued. Given my memories of this as a younger wine, I’m picking it as ‘in a hole’, but curious to see whether this is just an oddly backward bottle. It certainly wasn’t faulty. Good, not great. Best drinking: Wait 3-4 years. 17.5/20, 91/100+. 14.5%. Would I buy it? Not at the moment. What about day 2 ? The bottle didn’t last until Day 2 with this (was in a group). I looked at it over about 3hrs and it didn’t change much. Historically, once the most enjoyable aspect of primary moves on in St Henri, the wines always remain very medium and subdued until approaching 15-20 years old or more. Your tasting note reflects EXACTLY how I’d expect a decent 10yo vintage of St Henri to look. True, perhaps, but the ’04 is a much more expressive beast.